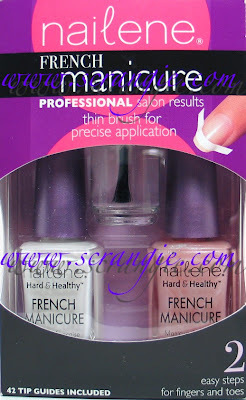 This second french manicure kit from Nailene is a little more adventurous. It includes the standard bright white tip polish, but also a sheer pink shimmer with strong green duochrome. Like the first kit that I reviewed, this comes with everything you need to complete your look. Base and tip polish, sealant top coat and 42 tip guides. Since tip guides were included with the kit, I used them for these looks. Here's one coat of white with one coat of the pink and green shimmer polish on top. Wow, my nails are stained... Oops! Here's the same, but with two coats of the pink and green shimmer polish instead of one. Two coats gives you a lot more coverage. That's good, that way you can't see how bad my stained nails look! Can you see all the pretty green shimmer? 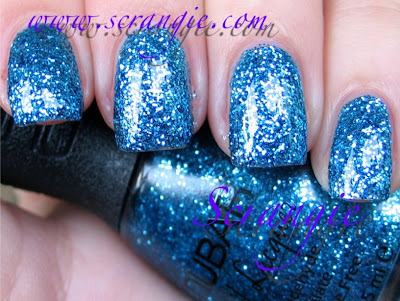 This polish seems like it would be great for layering. I think it would look pretty cool over a hot pink or coral, and it would be amazing over black. You can also add a little flair to it with Nailene's Bedazzle Nail Art Decals. I chose a swooshy one from the kit. I think it would also be pretty with one of the snowflake designs as well. Overall, this is another great kit for people who love french manicures. It's not the same plain pink-and-white french because this one has a little duochrome green shimmer added to it. It's extremely easy to use and there's no confusion because everything you need is right in the kit. It's an inexpensive and easy way to achieve a french manicure look without having to go to a salon. I'm all for being able to do your nails at home! This kit is available at any drugstore and can be found in the nail art section near the decals and artificial nails. Not to beat a dead horse or anything, but I'm sure you're all aware that french manicures and I do not mix. I feel very... strongly about french manicures. Indeed. However, there are some exceptions. I have seen or worn french manicures that I actually liked. For example, french manicures with glitter for tips instead of chalky white. So, when I received these artificial nails from Revlon, I was quite pleased. Finally, a french manicure I actually like! These are the Starlet nails from Revlon's Runway Collection series of artificial nails. 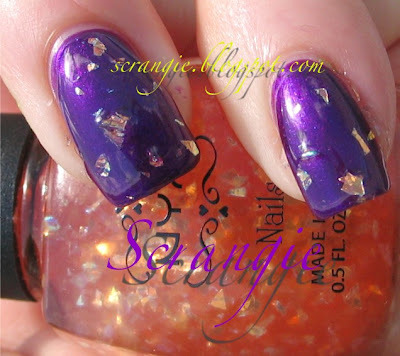 There are two styles of nails named Starlet- this is the first version. I'll post the second version soon- I just wanted to clear up any confusion caused by having two different styles with the same name. Anyway, this is a set of false nails, also known as press-on nails. It comes with 24 nails that come in 12 different sizes, a bottle of nail glue and an orange stick. The interesting thing about this set of fakes is that it has half sizes. Woohoo!! I am often complaining about sets of press-on nails that I would like to wear but can't because all the sizes are too large for my nails. These ones fit much better than any nails I've tried so far. I do have one complaint though- there aren't enough of the small sizes! I only do one hand for my pictures, but I used all but one of the smaller sized nails. I wouldn't be able to do both hands. They need to include more of the smaller sizes and less of the huge toenail sized ones. But then again, maybe my nails are just freakishly petite and regular people have nails the size of the ones in the kit. To apply them, you simply drip some glue onto your natural nail and press the artificial nail onto it. The glue bonds instantly. The application process is very fast and straightforward. I do have a few tips on applying them, though- it can be very messy if you haven't done it before. The directions say to put glue on the fake nail and on you natural nail- DON'T!! You will have glue everywhere if you do this. What I recommend is to put a very modest amount of glue onto your natural nail- don't cover your entire nail. The glue spreads out when you press the fake nail onto your natural nail, and even with a tiny amount of glue on your natural nail it can make a bit of a mess. The glue is a very thin texture and it oozes out from under the nail onto your cuticles. So, go easy on the glue. Since these are a transparent french-style nail, you need to be careful of air bubbles under the nail because they will be very obvious. To prevent air bubbles, press the nail down firmly, making sure to provide firm, even pressure across the entire nail. Do not release the nail until the glue is completely dry- it should only take about 20 seconds. If you don't apply pressure until the glue is dry, the nail will lift from the natural nail and cause an air pocket. Now that that's out of the way, here's what they look like on me! Pretend that you can't see my pinkie nail sticking up over the top of the fake nail. I filed my nails down as short as they will go without bleeding and they're still a little too long to be covered completely by these nails. Here's what I like about this particular french manicure design. As you can see, instead of a thick bright white tip, these have a subtle semi-sheer natural looking tip with a fishnet/lattice design. I love the design on the tip- it has personality! The shape of the tip has a subtle and natural smile line that perfectly mimics the line of my naked nails. The shape of the nails themselves is also very flattering- soft square. This shape looks good on everyone and it gives the nails a very groomed and professional look. The colors of the nail are completely natural and clean looking. The base matches the color of my natural nail but provides just a hint of sheer milkiness. The tip is also very natural and has just a hint of pink to it. If you can see from the pictures, it's not a solid color. It's made of teeny-tiny dots of sheer color! The best part about this nail for me is that from a distance these don't look french. They look like clean, shiny natural nails. Only when you look at the nails up close can you see that there's a french manicure with a fishnet design on the tips. One more thing I love about these particular nails is the thickness of them. They aren't thick at all- they are perfectly thin and not obviously fake looking. I know I've used the word 'natural' about a million times already, but these are so natural looking, no one would be able to tell the difference! There are a couple things I don't like about the nails. For one, they're very short. Like I mentioned above, my nails are filed down as short as they can go, yet my natural nail is still longer than the artificial nail. I have long nail beds, so my nails are long even when they're short. A slightly longer length would be perfect. The other thing I don't like about the nails is the size. Again, like I mentioned above, there aren't enough of the small sized nails in the kit to do both hands. I think I used the same size nails on all but my pinkie- 7 or 6.5 and then an 8 for my pinkie. I think there was one leftover 7 in the box when I was done. So, overall, this is a really great nail. It's not something I would normally wear, but the fun design and the natural, non-tacky look of this french manicure are really appealing to me. They're fast and easy to apply, and they're inexpensive to purchase and maintain. Think about it this way- a fill on a set of enhancements will set you back around $50-$70 a month (not including tip!) depending on where you go... Four boxes of these press on nails will cost you around $20 tops per month, and you can do them yourself. You might be able to get two full manicures per box if you have larger nails than I do. No damage, no unhygienic conditions, no appointment, no tip! These can be purchased at any drugstore (though they're with the nail art section and not the regular Revlon section) and they're around $4.50 a box. Despite my feelings about french manicures, I get a surprising amount of emails and requests for them! So, when I received the opportunity to try out some french manicure kits from Nailene, I thought it would be the perfect chance to address all of those requests. This is the first kit I tried. It includes a clear topcoat, an opaque white creme, a sheer pinky beige and a sheer warm pink with blue duochrome plus 42 tip guides. Since guides were included in the kit, I used them for these french manicures. Please excuse the 'bruises' on my nails. French manicures aren't ideal for hiding them! For this manicure, I placed the tip guides on my nail after my base coat was completely dry. I painted one coat of the opaque white over my tips, waited for it to dry and then removed the tip guides. I used two coats of the sheer pink beige on top and I sealed it with the included topcoat. Here's the same manicure with a few decals from the Nailene Bedazzle line. For this look, I started with white tips and then applied two coats of the sheer pink with blue duochrome and sealed it with the included topcoat. Since this polish has a little more color than the other one, it caused the white tips to appear yellow. Normally, I would start by painting tips first, but for this shade I would recommend doing the tips last. I should point out the difficult part of doing the white tips second while trying to use the guides. I'm sure you've all experienced it before. If you try to place the guides on top of an already polished nail, they will often peel off the polish when you remove them. You can remedy this a little bit by removing some of the stickiness from the guides. Put them on the back of your hand once or twice- it causes them to become less strong and sticky and reduces the chances that it will peel off the polish on your nails. You also should wait until the base polish is 100% dry before attempting to use guides on top. This decal was a little too stiff and wouldn't lie flat on my nail. You can see in the photo that the edges of the decal are sticking up and visible. It may have been too cold out when I tried to apply the decal- it might become more flexible if you warmed the sheet between your hands or near something warm first. This kit was extremely straight forward and easy to use. It would be perfect for beginners and people experimenting with the french manicure look. People looking for a more natural looking french may not be satisfied with the white tip polish included in this kit because it is very bright and stark. If you're looking for a more natural french manicure look, try using two coats of the sheer pink beige color as your tip color and then one coat of it as your base color. Alternately, you could add some white and sheer pink into the clear topcoat to create a custom tip color. 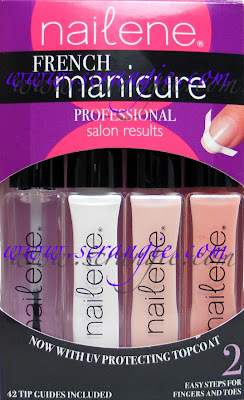 Nailene French Manicure Kits can be purchased at any drugstore. I just saw this on KO's facebook page- new colors! On the top are Calamine and Karen, which we already have. But on the bottom- Ox, a matte purple and Liberty, a matte mint green! They also mentioned two more colors to be released- Pool and Concrete (I'm going to assume they're blue and grey). Looks like the companies really are listening to us. KO polishes can be purchased directly from the company's website, although I have heard some complaints about the customer service. I have two new Sephora by OPI polishes that I want to swatch, but my nails are in no condition for swatching right now. I always break them doing stupid things! Opening cabinets, car doors, doing laundry... Ugh. 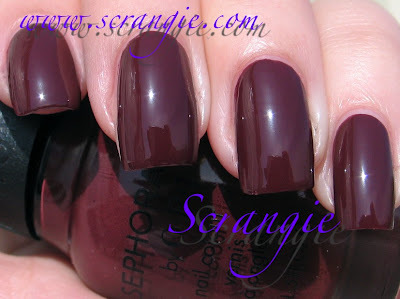 So, instead, let's revisit the Sephora by OPI line. 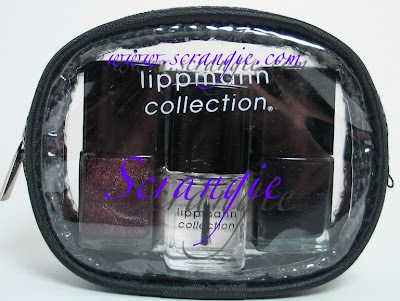 When it was originally released, I did a bunch of swatches with all the polishes I bought. The formula was so thick and awful that the swatches suffered. Now I've added some thinner to them and they've come out quite a bit better. Beauty Junkie. I admit that I only bought this for the name. It's kind of a vampy-brown-red-plum creme, too red to be chocolate. Cab Fare. Yellow with shimmer. It's pretty sheer in addition to being thick, stringy and goopy. All yellows are streaky and thick to some extent, but this one seems worse than others. The color is pretty nice and I like the sparkles. Call Your Mother. Very pretty muted taupe-purple creme. Charge It. Metallic gold. 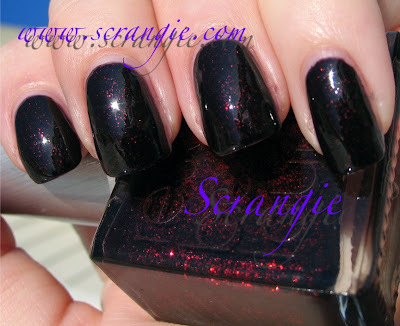 This one is pretty similar to Chanel Gold Fiction. I haven't done a side by side to see if they're exact dupes, but they have a very similar shade and texture. Domestic Goddess. Bright candy grape purple creme. Don't Go There. Another nice muted purple creme. Never Enough Shoes. Black with multicolored glitter. The glitter in this is small and subtle. Queen Of Everything. 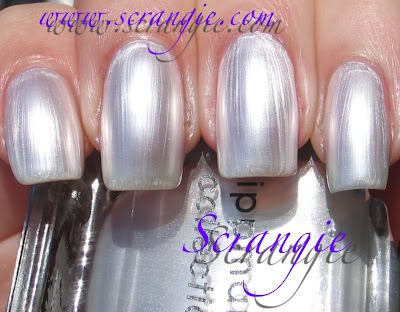 Gorgeous metallic platinum-silver. Run With It. Warm grey with coppery speckles. Reminds me of wet cement. 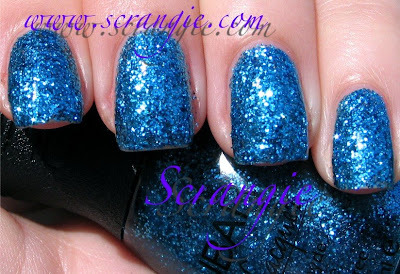 Sort of similar to Zoya Harley. Like I said before, I was not impressed with the formula of these. It's not consistent with OPI's formula, it seems like a completely different brand. Not all of the polishes were bad- some were a normal texture. The rest were insanely thick and gooey. I added thinner to them and it helped tremendously. Also, a lot of them have streaks of unmixed pigment that never mix back in no matter how hard you shake it. The streaks will occasionally transfer to the nail. I don't like the way the bottles look, either. They look cheap and strange. The plastic they use to seal the bottles is also difficult to remove. Nice colors, but I feel like they need to to a little quality control on these before they sell them. Hopefully my nails will grow back soon so I can swatch my new ones!